Any devotee of David Allen's Getting Things Done will know the importance of the in-basket. 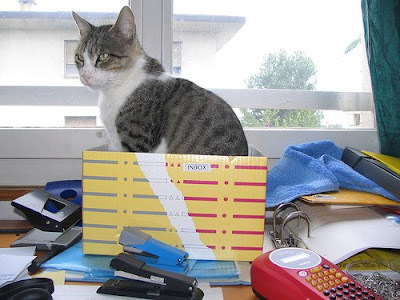 Allen actually recommends that you have at least three paper-holding trays: one for an in-basket, one for an out-basket, and others for work-in-progress support papers and/or a "read and review" stack. Liz Davenport in Order From Chaos also writes about the in-box. "What goes into the In Box? Everything new. New mail, new phone messages, new faxes, new information form others, anything you have not yet seen, reviewed, or dealt with. Other people put things in your In Box, but so do you. If you return from a meeting with a project file full of things to follow up on, but you have to run off to the next meeting before you can deal with them, put the file in your In Box for later review." Davenport also recommends a To Read Box and a To File Box. Now, what do you use as your in-basket or in-box - and those other baskets/boxes? Any office supply store will sell you trays that can work - but here are some other options. 1. 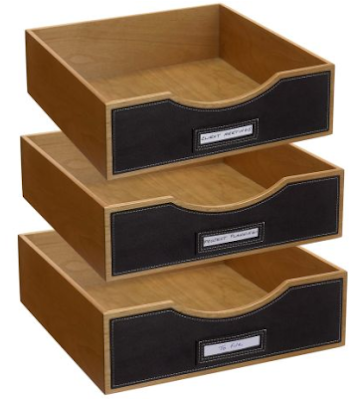 Levenger sells these stackable drawers. Update on April 27, 2014: I'm no longer finding these on the Levenger website. 2. Levenger also has this leather letter tray. You can find other leather trays at Frontgate, Prestige Office Accessories and Bosca Leather. 3. 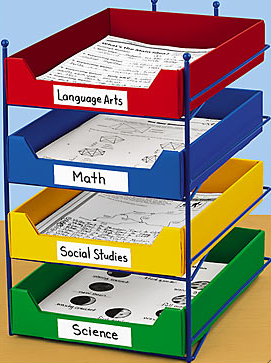 If you'd like something a bit different with stacking trays, there's this one from Lakeshore Learning - intended for teachers, but perfectly fine for anyone else, too. 5. 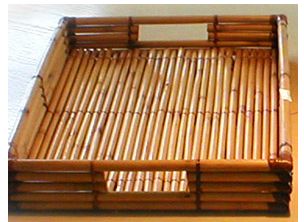 Here's a bamboo tray that could work just fine. Update on Sept. 9, 2010: The site that sold this tray no longer seems to do so. 6. 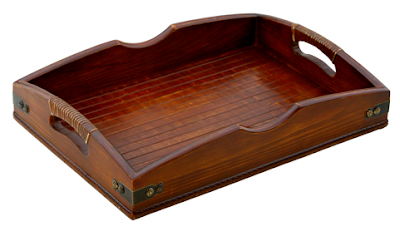 This hardwood serving tray could work fine, too. 7. 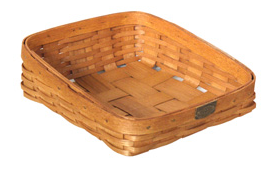 For those who would like an actual basket for their in-basket, there's this one from Peterboro Basket Company. 8. 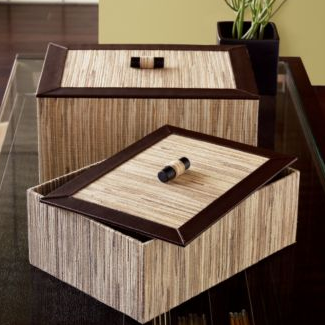 These water hyacinth boxes are yet another nice option. I'd leave the lid off on a day-to-day basis. 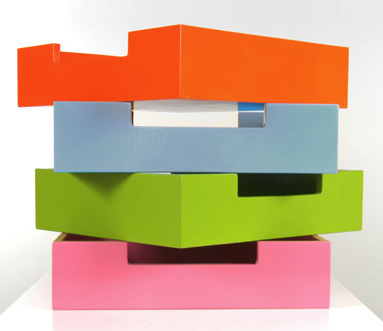 Update on Sept. 9, 2010: Crate and Barrel no longer sells these boxes. 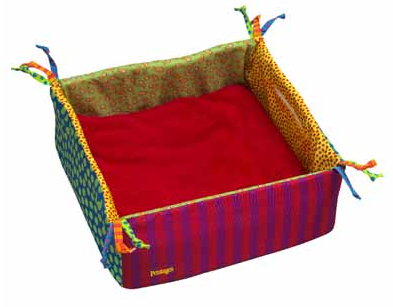 Love the kitty bed! What a great way to repurpose something. I've just gotten into this concept and what fun it is to look at old things in new ways. Glad you like it,Michele! Repurposing is both ecological and fun - you get to be creative and you wind up with storage unlike anyone else's. And you can save some money, too. Now Where Did I Put That Note? Ethical Question: Donate the Baby Bottles? How Many (and Which) Books to Keep?